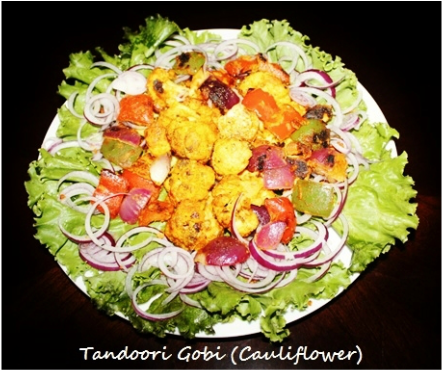 Tandoori gobi (Tandoori cauliflower) is so tempting and delicious that one cannot resist eating them. The roasting process brings a whole new flavor to the cauliflower. 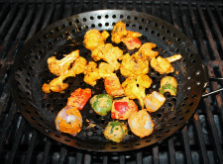 First cauliflower florets marinated in spicy yogurt which is prepared by adding grated ginger, minced garlic, fenugreek leaves and tandoori masala, then these florets are roasted on barbecue grill or oven. 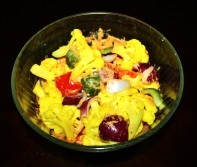 Indians love cauliflower, they never seems to get enough of it, especially Northwest India. In winter time it is cooked in some form at almost every meal. This particular fondness has resulted in numerous ways of cooking this vegetable and roasted cauliflower is one of them. 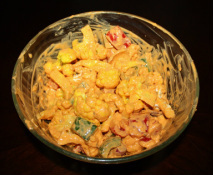 Tandoori cauliflower is fun to make and they could be added to summer barbeque parties or served as a snack in parties. 2. . 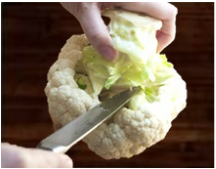 Remove the outer leaves from the cauliflower head. the stalk is removed, the core with the florets attached will be remaining. 4. Now begin to remove the florets by cutting each cluster from the core, leaving about 1” stem with each floret. Finish cutting the remainder of the head in the same manner. Keep each floret into uniform size pieces. 5. 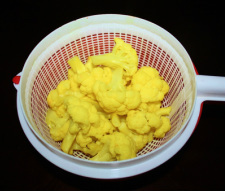 Wash and rinse the cauliflower florets. 6. 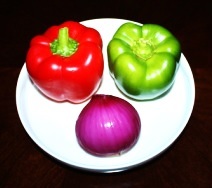 If roasting onions and capsicums then remove the seeds from the capsicums and chop them into 1” pieces. Peel and cut the onion into 1” chunks and separate the layers. 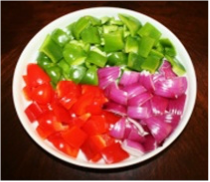 Chop bell peppers and onion into same size pieces so that they cook evenly. 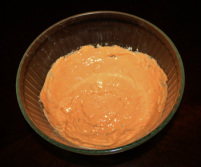 teaspoon turmeric powder and ½ teaspoon of salt and mix. 8. 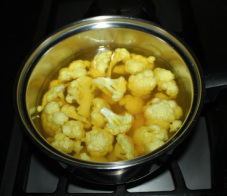 Add cauliflower florets in boiling water and cook uncovered for 3 to 4 minutes. Do not overcook the cauliflower florets. 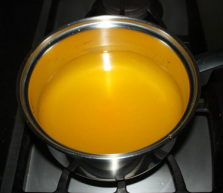 melted butter or ghee and mix them together and make a smooth mixture. 12. Apply a light coat of cooking oil on regardless of what type of skewers you use so that after cooking vegetables slides out easily. 13. Take one skewer at a time and thread the cauliflower florets crosswise through the stems onto the skewers the flower ends should all be pointing up. Thread capsicums and onions on separate skewers because they take different cooking time. Place the skewers on a plate and repeat. Cauliflower can be grilled or roasted several different ways. 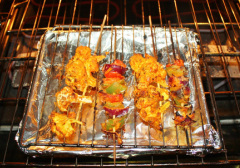 I have written how to grill in the oven, how to grill on barbeque grill or in the frying pan. Whatever way is convenient to you. vegetables with oil or melted butter. 2. Line the baking tray with aluminum foil to catch the drip if any so that oven tray does not end up with hard dried and burned marinade. Place the baking rack over the tray and place the skewers opposite to the rack tines so that vegetables do not drop through the tines. 3. Let the vegetable cook for 7 to 8 minutes then turn them around and let them cook for another 7 to 8 minutes or until they turn brown. 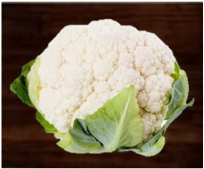 You will know when the vegetables are done when they start turning lightly brown, if you want you can also char them a little, but don’t overcook as the cauliflower becomes dry.The cauliflower florets should be tender, juicy and well cooked. 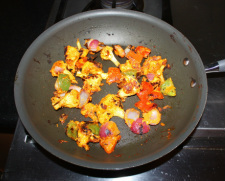 Capsicums and onions may take little longer to cook then cauliflower beacuse cauliflower is already half cooked. Timing of cooking varies because oven temperatures vary from oven to oven. 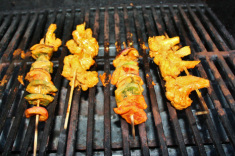 skewers and serve them hot with green chutney or mint chutney. 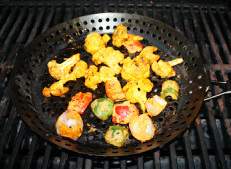 You could also grill cauliflower on outdoor grill (barbeque grill) or over the stove top grill. Grilling over grill gives smoky flavor. 2. Once the grill becomes hot with a wire brush cleans the grill. With the basting brush lightly oil the grate of the grill. 3. 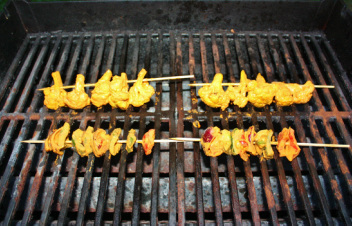 Place the vegetable skewers on the grill opposite to the grill tines to prevent them from falling into fire. 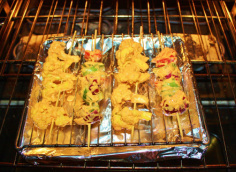 Keep the skewers approximately 3 “apart leaving space to turn them while cooking. With a brush baste the vegetables with oil or melted butter. 4. Cover the grill and cook for 5 to 6 minutes, then again brush some oil or melted butter over the vegetables and turn them around and continue to grill. 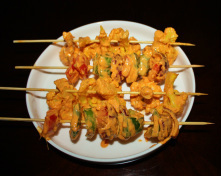 Keep turning the skewers around for another 5 to 6 minutes or until all sides of vegetables are lightly charred but crisp. 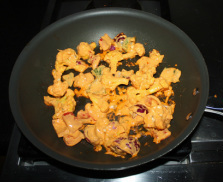 Capsicums and onions may take little longer to cook then cauliflower beacuse cauliflower is already half cooked. If you do not have oven, tandoor or barbeque grill don’t get discourage you can still make delicious grill vegetables in the frying pan. 1. 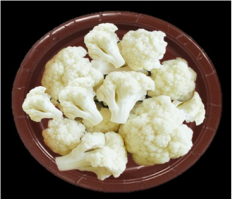 Select cauliflower which is clean, firm and creamy white with compact florets. 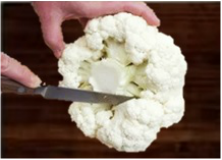 Avoid cauliflower that has brown spots or have grainy texture. 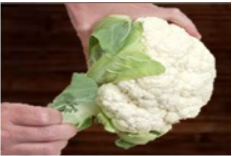 Refrigerate cauliflower until it is ready for use. 2. Paneer cubes, mushrooms, squash or even boiled potatoes could be added with cauliflower for roasting to make interesting variations and serve them with toothpicks as an appetizer or as a snack. 3. 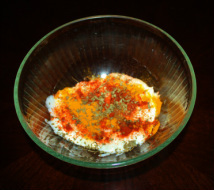 For marinate thick hung yogurt is preferred otherwise marinate become watery and it would not coat the vegetables. If you do not have thick yogurt, take plain yogurt, line a strainer with a cloth or a kitchen towel, put the strainer inside a mixing bowl. The bottom of the strainer must be suspended at least 1 inch above the bottom of the mixing bowl. 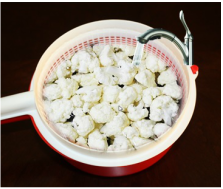 Pour the yogurt in the strainer and place it in the refrigerator and leave it for 3 to 4 hours or until all the liquid has drips out of the cloth and into the bowl. Scoop out the yogurt and it is ready to be used. Strained yogurt should be thick and less than half the original volume.